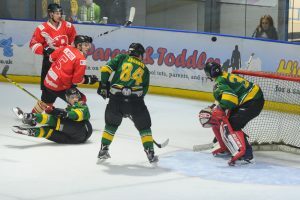 The RTL Widnes Wild are delighted to welcome Tom “TJ” Jackson and Tom “Ratty” Ratcliffe back to the Wild alongside new signings Matty Barlow and Daniel Bracegirdle. T J has been a Wild player since he was 18 signing for the Wild mid-way through the Wild’s first season. TJ has played over 100 in a Wild shirt and his personal developed has run parallel to the Wild. “TJ has been a Wild player from the beginning, and it’s important to have guys like TJ on the team. TJ is a big part of the D unit, I am happy he has returned to the squad giving us competition for places in Defence, which will push the squad to improve together”. “It was a easy decision to come back. I love playing at Widnes and everything about the club. I look forward to the start of the season”. Another young player who joined the Wild in the teams first season, Tom Ratcliffe has become a fans favourite and an oppositions nightmare. Although his third season was interrupted by a spell in North America playing for the Charlotte Rush, Ratty has still managed to play 81 games for the Wild. “I’m excited to be back at Widnes and looking forward to getting back on the ice with the boys for my 4th season with the Wild. Widnes has always been a great set up and without doubt has the best fan base in the league. 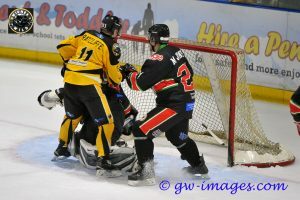 “I am looking forward to giving all my hockey focus to The Wild this season and as last season it was sometimes a difficult situation to play on a ‘two-way contract’, although I do feel I improved vastly as a player with the experience the Manchester Storm offered and I am grateful for the opportunity. My personal goals for the season are to have more of a presence on the scoreboard and generally give everything I can to the team as a whole and the people in Widnes”, Ratty continued. J oining the RTL Widnes Wild for the first time is 18 year old Matty Barlow, who has come through the Bradford junior system and scoring 1.49 points per game at Under 18’s level. Last season Matty played for both the Bradford Bulldogs and Deeside Dragons. “I’d like to welcome to Matty Barlow, who joins from Bradford”, commented Ollie. “Matty is a great young player, who I am looking forward to be working with this season, He stood out for me in games we played against him last season, I’m glad he’s on board and he will be looking to work his way up our roster, and put in good performances for us this season”, continued Ollie. Lastly the Wild would like to welcome back D-man, Dan Bracegirdle after a two season absence. Dan signed for the Wild before the first ever Wild game and played for the Wild in our second season as well. 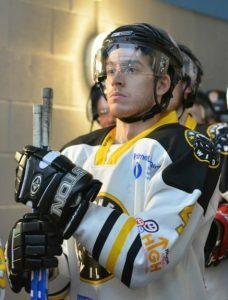 Unfortunately Dan’s second season was cut short due to illness and although he was announced as signing for the Altrincham Aces in their first season he didn’t actually ice for them. Although technically a new signing for Widnes, Dan has played 56 games for the Wild. “Dan returns to the Wild after time away from the game, he’s hungry to earn his ice time and help out the team in anyway he can. Dan skated with us on our first weeks practice and I liked what I saw, I’m pleased he is joining our squad”. TJ will once again wear 84, Ratty will wear the number 40, Matty will wear 11 and Dan will wear the #4 shirt. All of there home, away and warm-up shirts are currently available to own ‘n’ loan. The Wild would like to thank Karl Niamatali who won’t be returning to the Wild this season. Karl played 14 games and scored 15 points but unfortunately suffered a number of injuries which limited the number of games Karl could play. We wish Karl the best of luck with his future.